Just as we took stock of the recovery across Oregon’s regions the other day, it can be useful to track recovery with other regional economies. 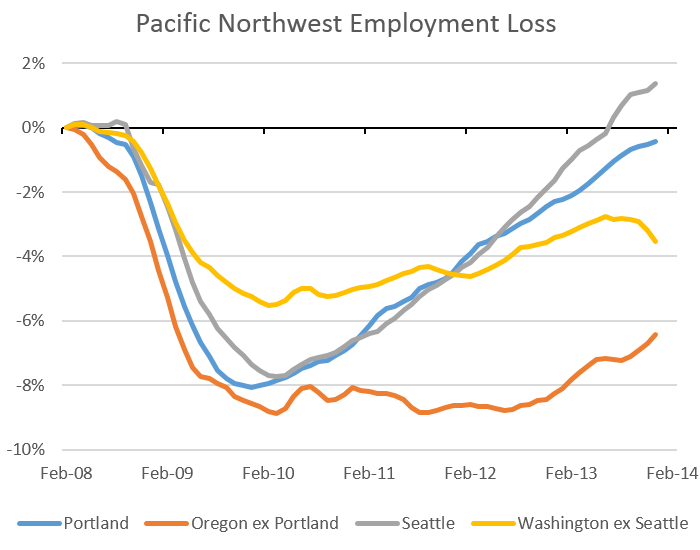 Last time we checked in on employment in Oregon and Washington, the recession and recovery in Portland and Seattle were nearly identical. The largest difference was the fact that Washington’s medium sized cities and rural areas did not experience as deep a recession as Oregon’s did and Washington’s were growing back in 2011 and 2012. Today, the opposite is true of areas outside each state’s largest metro. Growth has slowed in Washington’s medium sized metros and rural areas while it has picked up strongly in Oregon’s — particularly Bend and Medford, although Salem has joined the party as well. Seattle has pulled away from Portland’s growth path in the past year — and has one of the lowest unemployment rates for large cities. However, Portland’s growth has been steady and strong. The Portland Metro will likely regain all their recessionary job losses in the next couple of months. As Tim Duy has recently highlighted, Portland’s recession and recovery has been right in the middle of other cities with population about the same size (1.8 – 3.5 million).